Pesto is a truly versatile sauce, hot or cold it can accompany many dishes and often enhance what flavors exist in your dish or add a whole new layer to the dish. Pesto originated in Italy in the Genoa region, the name comes from the historical way to make pesto which was to crush or pound or pestâ in Italian. 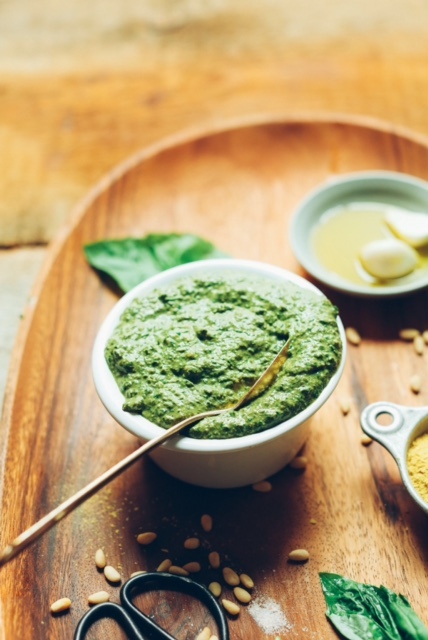 The classic Genovese pesto consists of garlic, pine nuts, salt, basil leaves and Parmesan cheese, this green paste has since been taken to the next level with the creativity of chefs. You can use pesto as a sauce as its own on pastas and meat, add to marinara sauces for a nice change, tie cream sauces together nicely with the savory herb flavor and sharp Parmesan flavor. You can even use it in unconventional ways like mixing it into a soft cheese (goat’s cheese, cream cheese, and baked brie). But one of my favorite ways to enjoy pesto is with potatoes believe it or not, this works the best with either oven roasted potatoes or deep fried potatoes as the pesto soaks into the potato very well. Below is a quick and easy recipe you can whip together in a food processor or blender and impress your friends and colleagues with your high class looking potatoes or spread on your sandwich. It also stores well in the fridge covered for a few weeks. 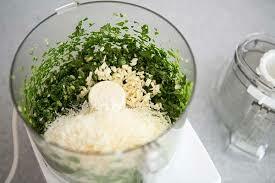 Add all ingredients to the blender or food processor and mix until all incorporated together then store in a container with a lid (perhaps a jar) in the refrigerator.